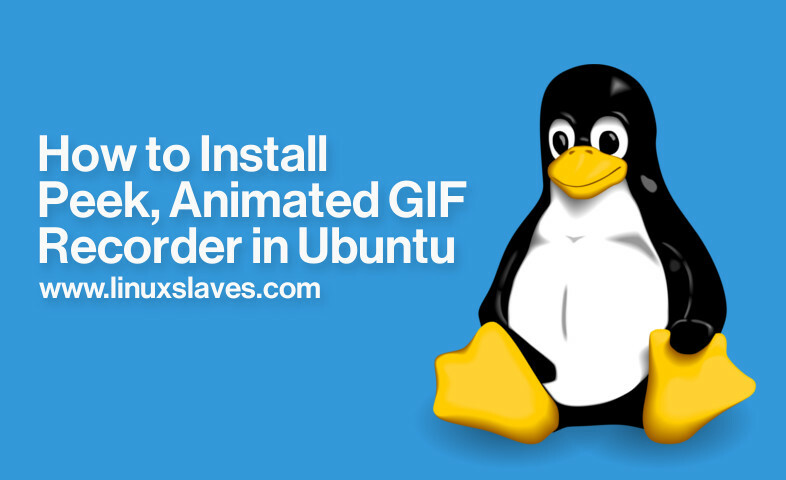 Animated GIF Screen Recorder App for Linux - An animated GIF images are not only for funny purposes. They are also can be used to make short explaining how to use a specific tools, features, bug reports to explaing the developer, and so on. Well, if you're an Ubuntu Linux users, you can easily record any selection of your screen and export it as animated GIF image using Peek. Peek is simple free and open source that allows you to record short animated GIF images from your screen. Currently only Linux with X11 is supported. Other Unix like systems using X11 should work as well. It is planned to also support Wayland and maybe other operating systems in the future. This tool developed by Philipp Wolfer and released under the terms of the GNU General Public License as published by the Free Software Foundation. As mentioned earlier, you need to install the requirements before using Peek. Currently, the latest version is 0.8.0 with bug fixes and UI improvements. You can grab the .deb installer from it's GitHub page. The link provided at the last line of this post. How to use Peek Animated GIF recorder? Step 1 - Open Peek via Unity dash, app launcher like Synapse Launcher, or similar tools. Step 2 - You'll have a window with transparent background. You can resize the window to select a screen area. You can now open the animated gif using Image Viewer. That's it! These were all how to make an animated GIF in Ubuntu Linux using Peek. Hope you've enjoyed reading this tutorial as much I’ve enjoyed writing it. Thanks for visiting us!